Project management is an exciting field. PMI-certified project managers are highly sought after and valued by employers, which is reflected in their compensation. According to PMI, by 2020, project management practitioners can expect to see almost 16 million new project management-related job added to the global workforce. Most of these new jobs are expected to crop up across seven primary industries: business services, construction, finance and insurance, information services, manufacturing, oil and gas, and utilities. 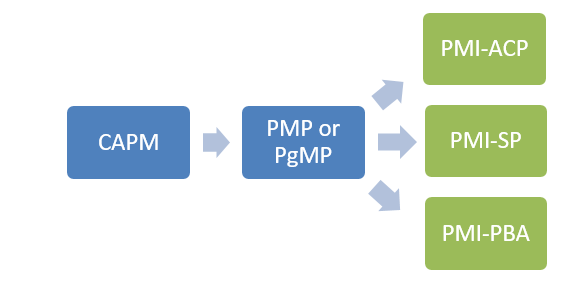 The most well-known career path, particularly for CAPMs and PMPs just beginning their careers, is that of project manager. However, you'll also find certified PMI professionals working as project coordinators, project schedulers, project management office directors, or managing projects for top-tier accounts. PMI-ACP certified practitioners frequently work as Scrum masters or agile project managers. More experienced practitioners, such as PgMPs and PfMPs, often find themselves managing and directing multiple programs or developing and managing strategic corporate portfolios. PMI-PBA certification holders frequently work in policy planning or business analyst roles. Project management professionals interested in managing and reducing risk may be attracted to roles such as value-based engineering coordinators/project managers or regulatory implementation and compliance. Regardless of your area of interest or preferred industry sector, project management-related careers abound and the demand for PMI certified professionals is expected to remain strong.